Join me this episode as I talk about my trip to the Virginia Comic-Con in Richmond on March 4 where I hosted a lecture about “Comics Podcasting 101” and also had the opportunity to interview Gary Cohn (Amethyst, Blue Devil) and comics journalist and writer Bob Sedaro. Plus, I have some listener feedback! You heard from the kids, now it’s the grown-ups’ turn! Join me and Gene Hendricks (The Hammer Strikes) as we recap our time at the 2017 Baltimore Comic-Con. We talk about creators we met, comics we bought, and our chance meeting with Darren and Ruth Sutherland of the RaD Network. Plus, you’ll hear me talking to comics legends Marv Wolfman, Michael Golden, Jerry Ordway, and Joe Staton. Some pictures of our quick podcast meet-up, a picture of Brett with Walt and Louise Simonson, and the comics I had signed and some that I bought. Your TTF hosts for this episode. It was great meeting Gene and his family. New Teen Titans #2 signed by Marv Wolfman. More con talk! I wrap up my coverage of the 2016 Baltimore Comic-Con by sitting down with Professor Alan to talk about our experience at this year’s convention. We discuss con prep, creators we met, what we bought, and what we thought. Then, join me, Stella, and The Irredeemable Shag for a conversation over Mexican food during Shag’s recent visit to Charlottesville. Plus … listener feedback! It’s that time of year again–time for the Baltimore Comic-Con! And this time, I’m not alone! In the first of two episodes covering this year’s convention, I am joined by my son, Brett, as we take a look at the Kids Love Comics portion of the Baltimore Comic-Con and he experiences his very first convention. Along the way, we have footage from the “Create Your Own Superhero Logo” session as well as the “Scribble Scramble” competition. Plus, creator interviews with Franco (Aw Yeah, Superman Family Adventures, Tiny Titans) and Alexis Fajardo (Kid Beowulf). AND … Brett winds up on TV! Come check it out; it’s loads of all-ages fun!!! Carolyn Belefski, who hosted the “Draw Your Own Superhero Logo” session. Franco, artist of many comics including Tiny Titans. Plus, below the jump are some pictures of cosplay and the convention from this past Saturday. Thanks again to the Baltimore Comic-Con for putting on such a great show! 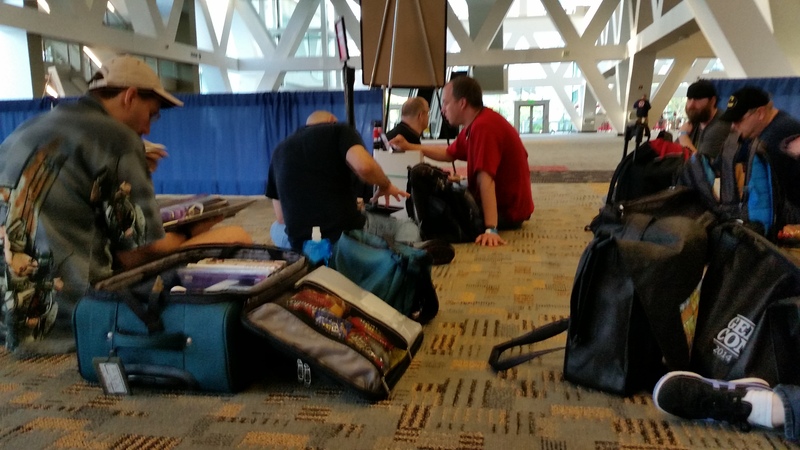 My recap of the summer of 2015 concludes with a look at this year’s Baltimore Comic-Con! I take you through all of the tedious prep, talk about the comics I had signed, and gush about what I bought! Pop Culture Affidavit, the podcast that covers everything random in the world of popular culture has finally arrived at Two True Freaks! To celebrate our big move and the podcast’s third anniversary, it’s time for the third annual Baltimore Comic-Con episode! I take a look at the 2014 convention and talk about creators I met, comics I had signed, and what a whirlwind day it was. AND be sure to check out the show notes for all sorts of exclusive pictures! And now, here are the exclusive convention extras, which means pictures! Pictures! Pictures!!! And a quick warning. These pictures are pretty large and very self-indulgent. Enjoy!